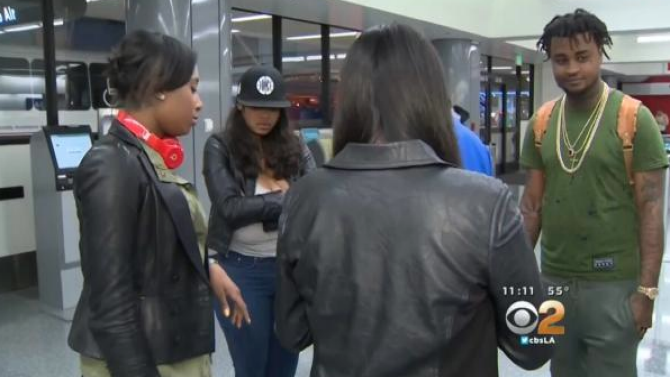 An overbooked seat led to six black passengers being kicked off a Spirit Airlines plane at Los Angeles International Airport Monday, and those passengers are claiming discrimination. A flight attendant asked a couple to change seats because the airline had overbooked. Witnesses say the couple told the attendant that asking them to move was unfair because they’d done nothing wrong. The flight attendant reportedly called the police to have the couple escorted off the plane. When some passengers protested the couple’s treatment, the flight attendant asked police to remove them from the plane, too. “I’m really humiliated, just for the simple fact that you hear about this type of stuff happening in America, discrimination issues and stuff like that, but to actually experience it firsthand … ” passenger Alexandria Wright, who was escorted from the plane, told CBS News. Spirit Airlines has had many complaints about many subjects over the last several years, I witness vomit on a seat of a passenger. When the passenger complained about it being in the seat – airline personnel told the passenger you can get off the flight if you don’t like our service. If you have a spirit Airline Story please feel free to post! I had to stop flying with spirit – lost my luggage 3 times!!! I like what you guys are up too. Such smart work and reporting! Keep up the superb works guys I have incorporated you guys to my blogroll. I think it will improve the value of my site. Hmm it looks like your site ate my first comment it was extreme.